Short and sweet: healthier employees mean a happier workplace, higher productivity rate, and more money on your bottom line. Now let’s dig into these details about how a corporate wellness program can put this into action. While you can’t necessarily snap your fingers and all of a sudden have an entire workforce of fully healthy people, you can put the opportunities in place that make it easy for your employees to get healthy and stay healthy. This may mean signing your team up for a corporate wellness program at Ellis Athletic Center. We offer discounts on memberships to make it more affordable to go to the gym. Our facility also has child care to make it easy for employees who have children to still exercise regularly. Health doesn’t just revolve around exercise and visits to the gym. It also means eating the right foods to supply the body with the best nutrients. The corporate fitness program at Ellis includes continual education about nutrition, diet, and fitness, so that employees are never left in the dark about how to live a healthy life. Most important for the company owners or health advocates within the business is this: foster a healthy environment in the office. Encourage those who are active and who eat well. Provide ample opportunities for both mental and physical breaks. Consider team building activities that get people moving, such as a summer softball league. 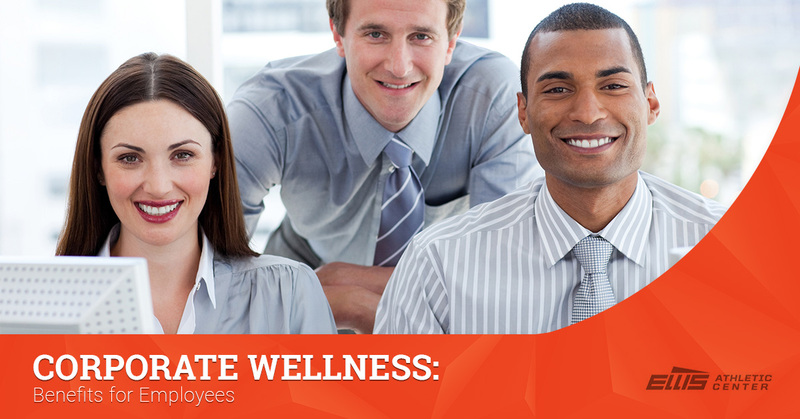 Fitness, nutrition, and a health-focused culture are three keys to getting healthy employees on your staff. Now let’s see how this can positively impact your business. Gym veterans are usually the type of people to set goals and achieve them. In the gym, it means pushing yourself to be better than the last workout. This same mentality can be easily replicated in the workplace. The gym is a place people go to exert physical energy, so make the workplace somewhere to exercise mental energy. From the top, encourage people to bring their A game every day, to stay positive when things get tough, and to always produce better quality work every day. Set goals. Create pathways to meet them. Encourage teammates along the way. These are just a few things you can do to create a connection between a corporate wellness program in the gym and the same attitude of productivity in the workplace. Success can be defined in a variety of ways. In the gym, it’s usually considered a success when goals are met. And as these goals are achieved, new ones at higher levels are set. It’s not always about lifting the most weight or running the longest distance. It can be getting to the gym a certain number of days each week, eating breakfast every day, and so much more. Likewise, a business can demand success of its employees by clearly creating benchmarks and goals, and then rewarding the employees who meet and surpass them as they arise. Each individual should have personal goals that help contribute to the overall company goal. Altogether, a business who focuses on physical and mental wellness will soar past their competition who leaves it out of focus. A physically and mentally fit company will achieve higher goals, which ultimately boils down to a higher profit for the company as a whole.